PONSHOP Studio and Gallery is excited to host our April First Friday reception, “The Art of Stoneware,” on Friday, April 7 from 6-9pm. Join us in appreciating the PONSHOP potters, as well as welcoming a new ceramicist, Ahnalisa Reavis, to the lineup. New work will also be on display by artists Scarlett Pons, Rachel Ruddle, and Matt James. Missed out on last month’s Terrarium Workshop? No worries! During the First Friday reception, Scarlett Pons will be instructing another workshop between 6 and 8pm. Register online or by phone prior to April 7th and the $40 fee includes a glass container and all other materials. Cultivate your own creativity this month in one of our many classes for children and adults. 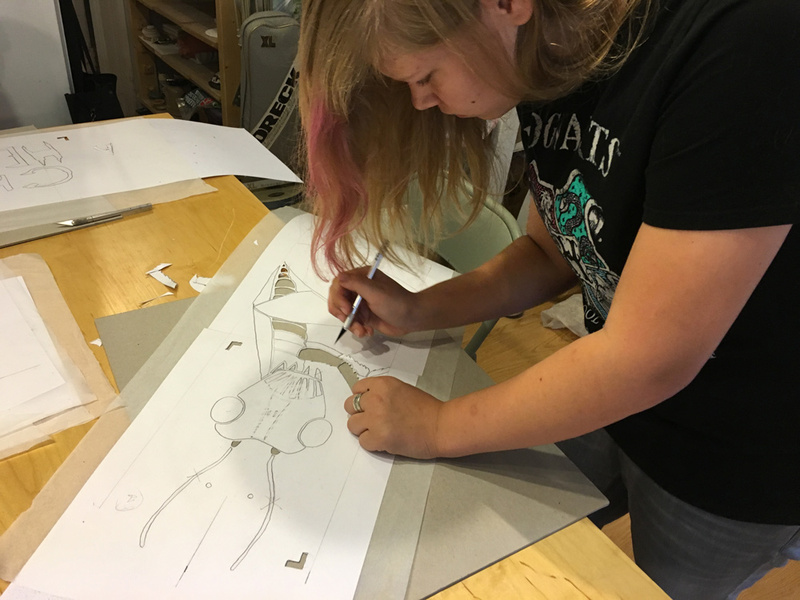 April’s classes include: Spring Break Art Camp, Adult Oil Painting, Adult Clay, Heroes and Villains Comic Book Workshop, and Kid’s Drawing Class. Our Complete Class Schedule can be found Here. PONSHOP Studio and Gallery is excited to host our March “First Friday” reception with the theme “Cultivate Creativity”. Join us in celebrating all things that grow as we usher in the beginning of spring with a Terrarium Workshop and a complimentary fine art exhibition featuring garden-themed ceramics and paintings. Revive your green thumb during First Friday’s terrarium party using D.I.Y. kits supplied by PONSHOP. Show up any time between 6 and 8pm, and walk out with a completed and one-of-a-kind mini mossy world. $40 registration fee includes a glass container and all other materials as well as guided instruction from PONSHOP owner Scarlett Pons. Green thumb not required, but Registration is Required prior to event. PONSHOP ceramic artists Matt James and Rachel Ruddle join Scarlett Pons in exhibiting garden-themed ceramics, planters, garden tags, and more. Local oil painter Jenna Anderson will be exhibiting select nature-inspired drawings and paintings, joining Maddie Huddle and Gabriel Pons on the gallery walls. Cultivate your own creativity this month in one of our many classes for children and adults. March’s classes include, Model Kit Makers, Skate to Create, Adult Oil Painting, Adult Clay, Paper Pop-Up Workshop, and Bohemian Dream Catchers Workshop. Our Complete Class Schedule can be found Here. Our flagship "Art Camp" program was five-day camp from 10am-2pm where each day, campers took on different art-based projects from drawing and painting to ceramics and terrarium-making. Our "Intro to Street Art" Workshop gave students an overview of the history of Graffiti and Street Art and provided instruction on using spray paint and paper stencils. PONSHOP held two summer sessions of "Heroes and Villains" - a comic book workshop where students created their own comic book characters using both drawing and narrative writing. 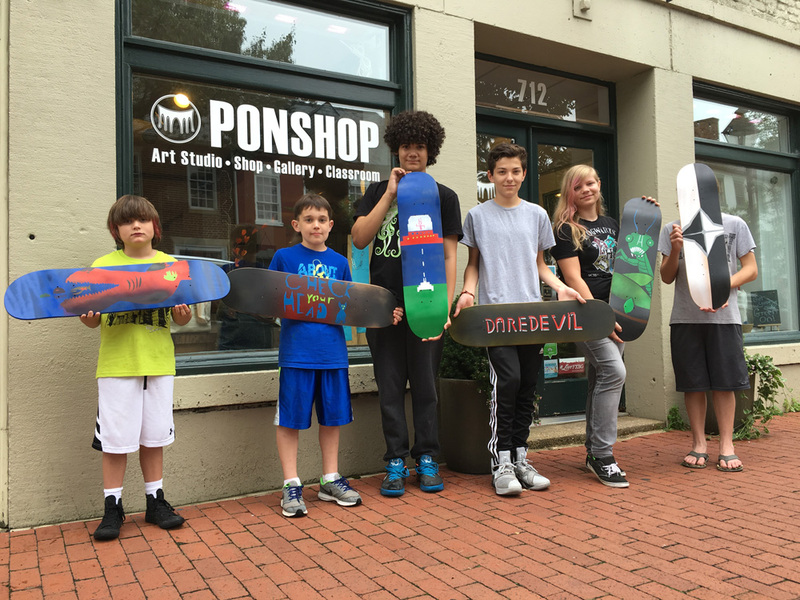 In this Summer Workshop, students used stencils and spray paint to adorn their own skateboard deck. Boundless Brooklyn is an innovative company established in New York by friends David and Terence. They provide blank model kits--including water towers, skateboard ramps, and more--that allow you to add your own personal flair. Made from 100% recycled material, these towers are great for all ages and fit perfectly on desks and shelves.